A parable is usually understood to be made up of two parts: 1) a simple, down-to-earth story; and 2) a spiritual, moral or religious lesson derived from it. Undoubtedly, the most famous parables in the Christian world were those told by Jesus, who routinely and intentionally taught in parables. The personal revelations that I receive occasionally from God more often come in the form of a vision that conveys some kind of spiritual message or revelation, but many years ago one came to me by way of a real-life, real-time parable. It was about how God, through the working of the Holy Spirit within born-again Christians, goes about the process that we usually refer to as “sanctification”. I hope this story will bless you as much as I was blessed as God showed me this parable when I was smack dab in the middle of it. We were living in Ithaca, NY, at the time. Our home was located “in the country” on Snyder Hill Road, just three miles from the campus of Cornell University. I had the house built to my specifications so as to be inexpensive to heat during the much-too-long and hard upstate New York winters. Besides, we were going to heat the new house with wood, and I didn’t want to stack and fetch any more firewood than necessary during the frigid, blustery heating season. 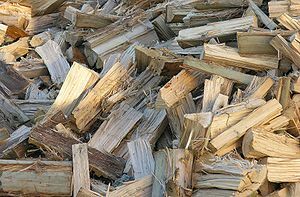 As it turns out, we only needed about one and one-half full cords of wood each winter, which is an amazingly small amount for that region. Nonetheless, every time I had a dump truck deliver a load of cut and split firewood and dump it in a huge pile about 30 feet from my garage, I had a big job ahead of me. The firewood had to be stacked in a neat row, roughly four feet high and as long as there was firewood left to stack. It took me about three sessions of about one and a half to two hours each to finish the job, and it was hard, physical work, to which I was definitely not accustomed! Well, I had, for many, many years, stacked the pile of firewood into a neat and straight row and cleaned up the mess of firewood “trash” that remains on the lawn, and nothing out of the ordinary had ever happened. True to form, I had developed a routine for the tedious, but necessary, task of cleaning up the “trash” after the firewood was stacked. I would begin with the largest pieces, those that were too small to stack with the normal firewood but very easy to spot and gather into a box to use as kindling whenever I needed to build a fire in my wood stove. With those larger pieces removed, I could then more easily spot fragments of a smaller size and gather them into the box. And so on and so forth, until there was nothing left but tiny bits and slivers that I was not even aware of until all of the larger pieces had been removed. I would then rake together as many of these minuscule remnants as possible and deposit them into the trash. Finally — applying the concept of “good enough” — I would declare the project finished, even though, if I looked closely enough, there were still left even tinier fragments that I had not noticed before. Oh well. So, one crisp, spring day I was busy cleaning up the trash after stacking the firewood for the next winter. First the larger pieces, those that were easiest to see, then the next-largest pieces that were now, themselves, the easiest to see, and then the still-smaller pieces which had seemingly appeared out of nowhere when all of the just-larger pieces had been removed. Then, I paused briefly to rest and catch my breath. I was standing there, looking out over the “debris field” and thinking about how I could see the next-smaller pieces only after the just-larger pieces had been removed, when it hit me. This is exactly how God cleans the sins out of our lives after we are born again! He begins by showing us the most conspicuous sins. These are the ones we are probably already painfully aware of, but have not yet dealt with for some reason. When these sins have been taken care of, it’s easier for Him to show us the less conspicuous sins, and we set about, together, to deal with those. And with those sins now out of the way too, it’s possible for us to see sins that we didn’t even know were there, and so on. Wow! I thought I was just was cleaning up the trash in my lawn, but God was showing me how He was cleaning up the trash in my life! Who would have ever imagined that such a simple task as cleaning up the trash left by a pile of firewood could produce a spiritual lesson of such magnitude?! But isn’t it just like God to teach us through the routine things of life, if we will just pause and meditate now and then? This entry was posted in Biblical Teachings and tagged Christian, cleaning, Firewood, God, Holy Spirit, lesson, parable, purification, sanctification, sins, spiritual, story, trash, winter. Hi, Yvonne, nice to hear from you. And thank you for this wonderful comment. I’m glad you liked the article, but I’m ecstatic that you have found a class that is helping you to begin to stack your “firewood”; that’s awesome! Indeed, God never gives up on us, and He does provide a way out when we need it. May the Lord continue to bless you richly as you continue to move forward with Him. You can do it! Great analogy. How about being so overwhelmed with the dump of wood that you get paralyzed; you don’t know how or where to begin to make a stack?! That has been me for many years. But a verse I memorized says: ” No temptation has overtaken you except what is common to mankind. And God is faithful; he will not let you be tempted beyond what you can bear. But when you are tempted, he will also provide a way out so that you can endure it. (I Cor. 10:13). Well God has provided a way out for me and I am taking a “Healing Journey Class (for women) by Cyndi Sherwood at our church. (google “His Healing Light Ministries”). It’s a 29 week course and boy are we digging deep. I haven’t taken a class like this since college- years ago! But I am getting so much out of it; we have homework every week. We examine lies we’ve believed about our relationship with God, ourselves and others. (Hey Janet- didn’t we study this topic of these same ole lies in bible study before? Yep!) In this course we are learning to make the choice to no longer be victims and be the victorious women God created us to be. I will finish the class in early June. I’m moving forward, stacking up with the logs of God’s Truth, a little at a time. Blessings!